Cain City was founded as one of the stops along the Fredericksburg and Great Northern Railway. It was a thriving town and until just about 30 years ago part of the old bank was still standing just a short distance from Hill Cottage. 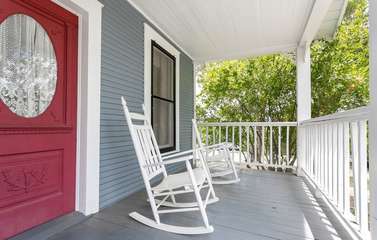 Located only a few miles from Fredericksburg this delightful quaint, little cottage boasts phenomenal views. The yard has a wonderful array of birds. The outside patio has comfy chairs, firepit and charcoal grill and is ideal for watching our feathered friends, rabbits, deer, and all the other nature so abundant to the area. The Adam’s family built Hill Cottage in 1912, and also were founders of Cain City. Pine floors, pristine white trim, fluffy white lace curtains, and rich rose walls enhance the playful mix of patterns in the floral sofa and plaid armchair creating a warm and inviting glow in the living room. Enjoy the Direct TV with DVD player. Two bedrooms (both with queen-size beds) are found on both sides of the bath. Comfy reading chairs are found in both bedrooms along with antique dressers and chests. The bath has a claw foot tub with shower. A completely equipped country kitchen has a range/oven, refrigerator, microwave, toaster and coffeemaker. The adjacent dining room has a table for four and antique china cabinet. Windows are conveniently arranged to enjoy the countryside views. The large patio and screened-in porch both have comfy chairs to sit and relax. Broadway Cottage is next door and also sleeps four—makes a perfect getaway for eight people. While making last minute reservations for a trip to Fredericksburg, we were running short on options. We were recommended to Gastehaus Schmidt by a friend. I called and spoke with Nathan. I told him what we needed, and he offered the Hill Cottage. We loved it! It was out in the country, but not far from some of the things that we wanted to go visit. The house was very clean and decorated nicely. The heat and air worked perfectly which was good because one day the weather was hot, and the next day it was cold. The beds were comfortable enough. We did not have any problems with the cottage. We enjoyed a fire in the fire pit one night. All in all, for the price we paid, it was perfect for us and another couple who stayed with us. I would recommend it to others and I would stay there again.